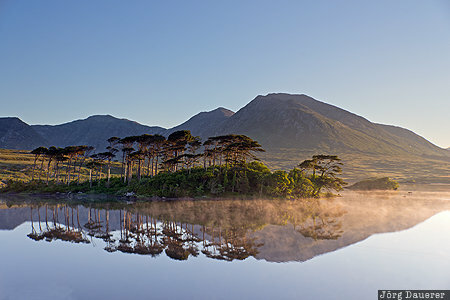 The pines on Pine island and their perfect reflexion in the calm water of Derryclare Lough near Recess with a bit of fog illuminated by warm morning light. Recess is in Connemara, County Galway in the west of the Republic of Ireland. This photo was taken in the morning of a sunny day in May of 2016. This photo was taken with a digital camera.